Located in the historic and beautiful Stratobowl. Sleeps 6. This home was built into the landscape of a rugged canyon. 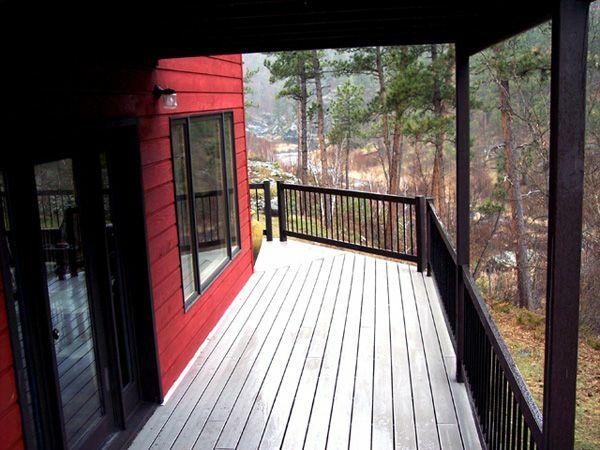 The location is very isolated, yet convenient to Rapid City and attractions. Large windows provide incredible wilderness view up Spring Creek. Surrounded by hiking and Forest Service land. A bighorn sheep area borders the property. The master bedroom has a king size bed and a sleeping loft with a queen size bed. A second bedroom has a queen size bed. Both bedrooms have private decks overlooking the creek. There is a well equipped kitchen and a very comfortable living room and a dining area. There is an entertainment center with a video library and local television channels (eight). There is a wraparound deck with seating and relaxing areas. The master bath has both a shower and a claw foot tub. The home is a one-of-a-kind, in a very unique and beautiful setting. It is about 20 minutes to Rapid City and 20 minutes to Mount Rushmore. Check in time is 3:00 PM and check out is 11:00 AM. We live in the Black Hills of South Dakota in a place known as the Stratobowl. This geological wonder is carved from the combined effects of water erosion and the uplift of a fault line in the rugged Spring Creek canyon. Secluded and idyllic, the property is reminiscent of another era. Maybe it is the silence, the old limestone cliffs, or the song of the creek meandering through the seasons. As these ancient voices surround us, we breathe in all the natural beauty. Peace melts into our being and comes out as creative expressions. When the moon is full, the canyon becomes an illuminated, mystical experience. That is why, at one time, this place was named 'Moon Valley'. Then, in 1934 and 1935, the Army Air corps and National Geographic Society launched manned balloon flights into the stratosphere from here. It was then, that the family field aquired its new name of 'The Stratobowl' while becoming the birth place for the space age. Surrounded by wilderness and mountainous terrain. All you need is your food. All kitchenware, utensils, paper towels, napkins, coffee pot, coffee pot filters, dish soap are provided. Address for the house is 23639 Strato Bowl Road/Rapid City, SD. Check-in is 4 P.M. or later. The owner/manager lives within 300 feet of property and will meet you at the office/their home, then follow you to your rental property. Check-in is a brief tour to let you know about the surrounding property, garbage, and to answer any questions. We rented both houses in the Stratobowl for a special family gathering and our experience could not have been better. The area by the swimming hole in Spring Creek was ideal for our group activities. There were also several hikes to explore the beauty and history of the area along with many awesome photo opportunities. Ken and Cory were devoted to making our stay wonderful. We have memories from our time here that will always be cherished. Incredible. Memories made that won’t fade! We are a group of college aged friends who traveled twelve hours to stay in this cabin. When we arrived we simply couldn’t believe the view we were looking at. The pictures can’t do it justice. The stay was amazing but quickly became impeccable and unforgettable when we met Ken and Corey. They invited us into their home and treated us as their own children. We all left their house that evening a little happier, a little better, and just over all more loving. The grounds are amazing and Corey and Ken are truly beautiful people. Worth every penny and every mile driven. Awesome open-concept cabin, incredible property - trails, creek, swimming hole, wildlife. We were going to do some of the tourist stuff - Mt Rushmore, Wind Cave, Badlands, but ended up staying on the property the entire time just enjoying Mother Nature's gifts, both animal and mineral, right there onsite. The price seemed a little steep until we saw the place, then it was instantly a great deal! Friendly and gracious hosts, with a mandatory and valuable tour to start out. Absolutely my favorite VRBO spot thus far. Hoping to return soon! Thank you, Michael. We are so glad you enjoyed our little spot in the deep canyon of life! Please, come back! Beautiful, secluded and quiet! We loved staying here with our family of 5. The house is even more amazing than the photos! Big windows allow a view from every angle. The house was clean well stocked and had comfy beds. The Stratobowl is a destination itself. Deer roam the property. Birds of prey hunt the river canyon. The decks allow you to relax and take it all in. I wish we had more time to explore the canyon and swim in the river. As others have said Ken and Cory are the perfect hosts. They gave us a great welcoming tour that oriented us to the house and the area to make the most of our time there. The Stratobowl is conveniently located - close to the airport and Rapid City and all Black Hill attractions. A perfect launching pad for your South Dakota adventures! If we return to the area we would absolutely stay here again. You cannot go wrong with this choice! A beautiful, secluded place. Our family loved our stay. Convenient to various black hills and Rapid City attractions, a lovely swimming hole, and some great nearby hiking. Surrounded by rugged terrain. Twenty minutes from Mount Rushmore, 40 minutes to Crazy Horse Memorial.